Each forage crop has specific requirements with regard to moisture, fertility, acceptable temperature range, and other factors. Also, each farm has areas with differing soil types, drainage, exposure, and other characteristics that affect plant growth. Therefore, some forage crops are best suited to some particular areas on a farm, while others are a better choice for other areas. Matching forage species with appropriate sites is just “common sense.” Nonetheless, a frequent reason for poor forage production is that a forage crop was planted in an area where it wasn’t well adapted. On many livestock farms, simply doing a good job of identifying which forage species will perform best on various parts of the farm, and then making planting decisions accordingly, will help ensure a diverse forage program. In most areas, Natural Resource Conservation Service personnel can provide a map showing soil types on a farm, along with suggestions for forage crops in various areas. The concept that it isn’t desirable to “have all your eggs in one basket,” applies to many things, including forage programs. Diseases and insect pests are often host specific; that is, they only attack a particular species (or a few species) of plants. In a few cases, some varieties of a particular crop are more resistant to a given pest than others. Therefore, the more different forage crops (and to a lesser extent, the more varieties within a species) grown on a farm, the lower the overall risk from pests. rather than it being harvested and presented to them. 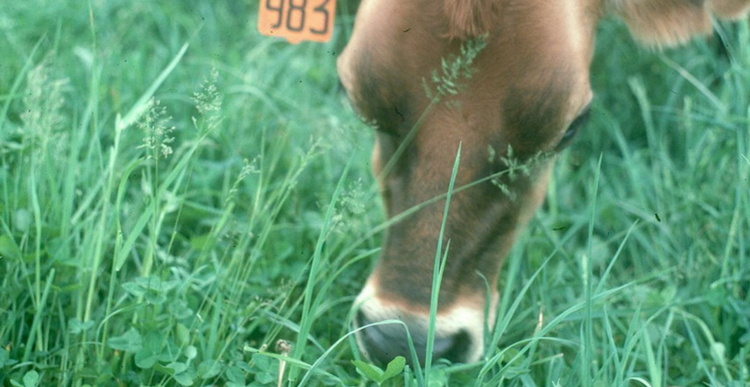 Thus, a basic desirable objective is to provide pasture forage over as long a period of time as possible. No two forage species have exactly the same growing season. Therefore, by having several different forage crops grown in different pastures, or even growing together in the same pasture, the distribution of pasture growth (and thus, the grazing season) is spread over a longer period of time. Growing more than one forage crop together within a particular field can also offer some definite advantages. The classic example of this is grass/legume mixtures. Legumes fix nitrogen that can be used for growth by grasses, while grasses reduce the likelihood of bloat from legumes and generally provide a higher forage yield than a legume-only pasture. Growing mixtures of compatible species can offer other advantages as well. Sometimes, one type of forage plant will offer cold weather protection for another, as when winter annuals are over-seeded in warm season perennial grass pastures. In addition, an upright-growing plant such as wheat can offer support for a viney plant like vetch. Furthermore, since the inherent composition of forage plants varies, there may be some nutritional benefit to livestock by having access to a mixture of different plant species. A final point of less importance, but definitely worth mentioning, is that it’s just more interesting to grow several different types of forage crops. There is a lot of truth to the old cliché, “Variety is the spice of life.” Using a diversity of forage species is a way to provide a little additional interest to the challenging business of being a cattleman.